Is LinkedIn perfect for grown ups? Some extremely prominent people (like Guy Kawasaki) are raving about LinkedIn at this very moment. “LinkedIn is a business oriented social networking site, mainly used for professional networking. As of January 2007, it had more than 9 million registered users, spanning 150 industries and more than 400 economic regions (as classified by the service). 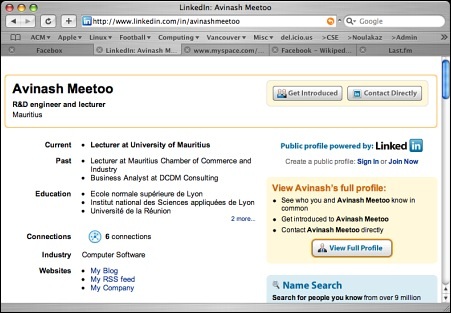 I’ve created my profile (http://www.linkedin.com/in/avinashmeetoo) and I’ve a couple of contacts. In addition to that, I’ve just sent 65 invitations to people I know professionally and, believe it or not, I’m watching them add me to their network in real-time. Personally, I see a lot of value in LinkedIn. What’s your opinion? I work for Guy Kawasaki, and I would like to thank you for your comments about Guy and his blog posting on LinkedIn! when i’ll get old..i’ll have one too..
but for the moment hi5 is nice..
LinkedIn looks interesting, although as with all the other social network sites I have signed up to, I doubt I will use it that much. Being an only-child probably is the reason why I am not so keen on much connectivity! well if i were to party with 800+ people..
Facebook seems to be for those still at school, isn’t it? high school and college level. And you can join based on the company you work for apparently… Seems way more serious than hi5 either ways.